As the United States faces escalating international tensions, who better to soothe the country than a septuagenarian chiefly famous for throwing the football and once shaving his mustache on TV? Joe Namath went on an oddly named new Fox News show called The Fox News Specialists and delivered his takes on North Korea last night. If the ostensible point of The Fox News Specialists is to have on, well, specialists, maybe the bookers were confused about what kind of bombs Namath threw. 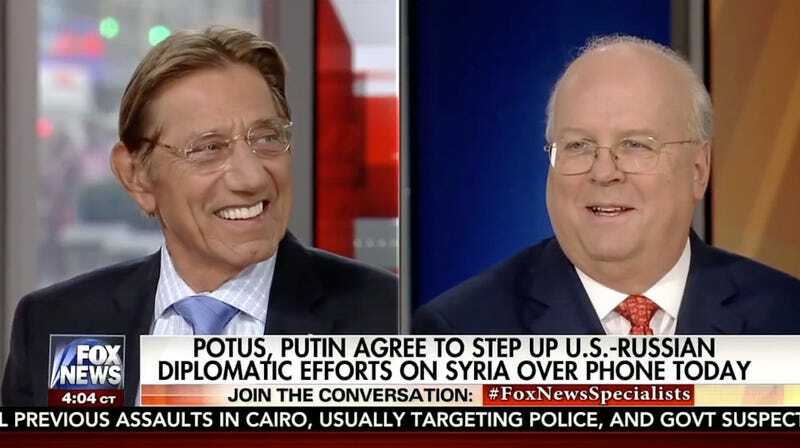 Broadway Joe was also joined by distended egg monster Karl Rove, who is perhaps less worth taking seriously on international geopolitics than a 73-year-old former quarterback who has admitted he has brain damage. Host Eric Bolling made a strained football metaphor to get Namath in the mood, stepped aside, and let Namath rip. Namath at least has the sense to say “Sports is a heckuva lot different,” before responding. If you can stomach a few more minutes, Bolling turns to Namath and almost exclaims, “Joe, let me talk to you about a wall.” Namath doesn’t really get to drop his takes, as he mostly corrects Bolling about yet another football metaphor, but he does later express his displeasure with Stephen Colbert. A nation holding its breath can now exhale. Remember When Joe Namath Was Accused Of Beating Up A Reporter?